Potential archaeological site loss from sea-level rise, grouped by elevation in meters above present mean sea level. All recorded sites within a buffer of 200 km from the present coastline are shown. Sea-level rise may impact vast numbers of archaeological and historic sites, cemeteries, and landscapes on the Atlantic and Gulf coasts of the southeastern United States, according to a study in the open-access journal PLOS ONE by David Anderson, professor in the Department of Anthropology, and colleagues. The study, published November 29, 2017, received widespread coverage in national and international media. To estimate the impact of sea-level rise on archaeological sites, authors of the study analyzed data from the Digital Index of North American Archaeology (DINAA), which aggregates archaeological and historical data sets developed over the past century from numerous sources and provides the public and research communities with a uniquely comprehensive window into human settlement. “Developing informatics capabilities at regional and continental scales like DINAA is essential if we are to effectively plan for, and help mitigate, this loss of human history,” says Anderson, lead author. 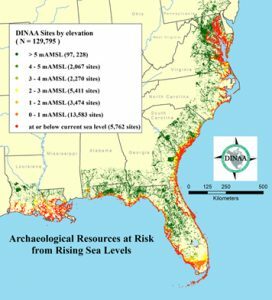 Just in the remainder of this century, if projected trends in sea-level rise continue, the researchers predict that over 13,000 recorded archaeological sites in the southeast alone may be submerged with a 1 m rise in sea-level, including over 1,000 listed on the National Register of Historic Places as important cultural properties. Many more sites and structures that have not yet been recorded will also be lost. Large linked data sets, such as DINAA, that show what may be impacted and what could be lost across entire regions, are essential to developing procedures for sampling, triage, and mitigation efforts. Such research is essential to making accurate forecasts and public policy decisions about the consequences of rapid climate change, extreme weather events, and displaced populations. These factors could shape our civilization profoundly in the years to come.